The Ransom Center’s Arnold Newman papers and photography collection, acquired in 2006, includes more than 25,000 prints, original sitting books, early sketchbooks, photographic albums, and video recordings of interviews and lectures. Newman, who lived from 1918 to 2006, was a prolific artist known for his “environmental portraiture,” a style which captures a subject in his or her typical setting. Conservator Diana Diaz treated sets of color slides wrapped in different types of tape. The slides came to Diaz in cardboard mounts. The slides were taped together in sets, blocking access to the images and sometimes obscuring portions of the slides. In his sitting book, Newman documented details of every shot he took including the location, film type, and client, as well as whether the photograph was in black and white or color. This type of information is useful when tracing a photograph’s trajectory from first shot to its publication. The slides had numbers that corresponded with Newman’s documentation system, but there were other handwritten numbers that did not match the records. In addition, the tape obscured the numbers on many of the slides. Because they were grouped together, it was impossible to determine how many projects appeared in each set, or even to see the images in the slides, unless the tape was removed. Diaz encountered some challenges. First, the three layers of tape had to be removed one at a time. Diaz lifted the outermost layer of tape using small tweezers and spatulas. The second layer of tape was in an oxidative state, which caused the adhesive to be overly sticky. At this layer, Diaz uncovered handwritten inscriptions on the slides. She applied warm water vapor with a preservation pencil, but was cautious of the inscriptions, which were also water soluble. Finally, she applied controlled heat to soften the adhesive and remove the last layer of tape. Removing the adhesive residue was the last step. The inner slides in each set were not as affected by the residue as the outer ones because the tape primarily touched the edges of the slides. 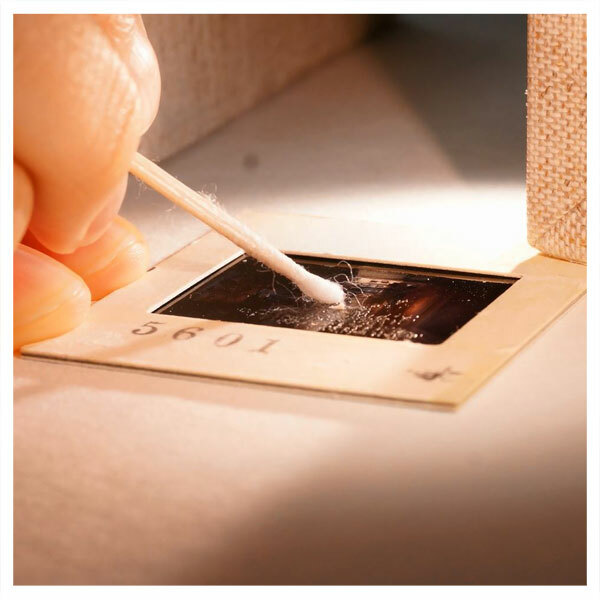 Diaz had to understand the chemical composition of both of the materials to determine which solvents would remove the adhesive from the slide without damaging the slide itself. After making these determinations and selecting appropriate solvents, Diaz performed several tests before proceeding with the original slides. The conservation treatment took about an hour per slide, and it was a time consuming operation because there were more than fifty slides. I’m a photo Conservator in Australia, and I would love to know what solvent mixture you found to be suitable for the slides. I’ve had to deal with mould, ferrotyping and accretions on chromogenic slides at various times, and it is always nice to have another treatment option. I’ve notified the conservation department of your inquiry/request. You should be hearing from them directly. Thank you!